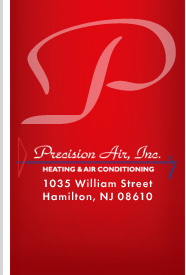 Since 1984, Precision Air has been providing residential and commercial customers with comprehensive home comfort services: preventive maintenance, conservation advice and equipment installations for their heating, cooling and indoor air quality systems. Our attention to detail and customer service has helped us expand our business over the years, as satisfied customers refer us to their friends and neighbors. We appreciate these referrals, and offer a generous referral bonus - which makes our happy customers happier! We recognize that not every manufactured piece of heating and air conditioning equipment is 100% perfect 100% of the time. Since our customers should expect to receive 100% of the heating and air conditioning value they've invested in, we offer a "No Lemon" guarantee. Simply stated, as long as you invest in, and keep your Scheduled Maintenance Agreement continuous, if the compressor in your air conditioner fails twice in the first five years, we will install a complete and new outside unit. If the heat exchanger in your furnace fails in the first ten years, we will install a new furnace. If you have ever bought a "lemon" before, you'll truly appreciate our commitment to your long-term satisfaction. We are available to service your furnace and/or air conditioner 365 days a year, day and night. We don't take a vacation. Since we are a service company, we have a staff of highly trained service professionals on call 24-hours a day. What that means to you is that we will come to your home and make any necessary repairs 24-hours a day. One of a homeowner's greatest fears is that a contractor who works in their home will make a mess or destroy it. We want to ease your fears by providing the highest quality in service and installation. We guarantee that we will leave your home BETTER than we found it or we will pay a cleaning service to come to your home and clean it in its entirety. We are that confident. (All we ask is that you notify our office of your dissatisfaction the same day that the installation was completed in your home). We are a service company, not a sales company. We prioritize our service; we provide service to our Service Club customers first. "Yes!" you heard that correctly. Our customers always get "front of the line" privileges. It means that when you need us, you've got us. As a member of our Service Club, we feel that you deserve to have us come to your home and make any repairs necessary before we do any other work. You mean that much to us. Precision Air is a member of the ServAssure Dealer Alliance, a group of heating and cooling contractors that works together to promote superior service, fair pricing and technical expertise. Members of the ServAssure Dealer Alliance must uphold strict standards of professionalism, and offer emergency service, flat rate pricing, and our 24-month, 100% Satisfaction Guarantee. Please visit our ServAssure page for more information. Precision Air is proud to hold the distinction of Carrier Factory Authorized Dealer. Carrier is a world-class maker of commercial and residential comfort equipment, and it bestows this honor only on select dealers who meet the company's strict requirements. Carrier Factory Authorized Dealers like Precision Air have demonstrated superior performance in installing and servicing Carrier equipment. Carrier also insists on an exceptional level or customer satisfaction based on customer surveys. Factory Authorized Dealers must also meet strict guidelines for insurance requirements, liability coverage, EPA certifications, warranties, product training, and installation and repair procedures. Precision Air is honored to receive Carrier Corp.'s President's Award for 2013. Carrier selects just a few companies nationwide each year for this honor, which recognizes excellence in customer relations. President's Award recipients are businesses that far exceed the high expectations that Carrier sets for its select group of Carrier Factory Authorized Dealers. 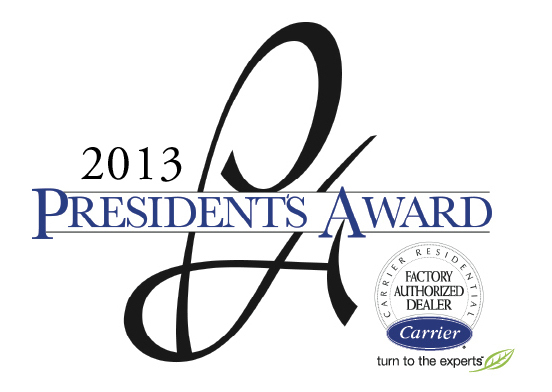 A President's Award winner is a company that Carrier holds up to other dealers as an example of true excellence. "It is an enterprise whose leadership, integrity and performance we hope all dealers will aspire to emulate," according to Carrier Corp.
Carrier relies on President's Award recipients like Precision Air to provide leadership for other Carrier dealers across the country. Winners have the opportunity to serve as role models, share their best practices, and offer peer mentoring. Precision Air could not have achieved this rare honor without the loyal allegiance of our customers and the hundreds of business referrals we have received. We are very grateful to the homeowners and businesses who trust Precision Air for their indoor comfort needs, and we pledge to continue finding better ways to serve you in 2013 and for years to come! Precision Air has earned a number of important certifications that demonstrate our expertise in heating, cooling and energy conservation. North American Technical Excellence (NATE): Precision Air's technicians have earned certification from NATE, the leading non-profit certification program for technicians in the heating, ventilation and air conditioning industry. Building Performance Institute (BPI): Precision Air is certified by BPI to perform energy audits. Our auditors are trained to perform comprehensive tests that gauge a building's efficiency and identify energy conservation opportunities. Home Performance with Energy Star: Precision Air is certified to perform energy audits and energy-related home improvements.